Designed by FaulknerBrowns, Coventry’s new The Wave, leisure centre is taking shape ahead of its opening this spring to coincide with city’s European City of Sport status. Reflecting the city’s weaving history, the £36.7m building project is a unique, circular shape and will include a 25m swimming pool, a spa and a spectacular water park with rides and play items to suit everyone from the bravest thrill seeker to the youngest novice. 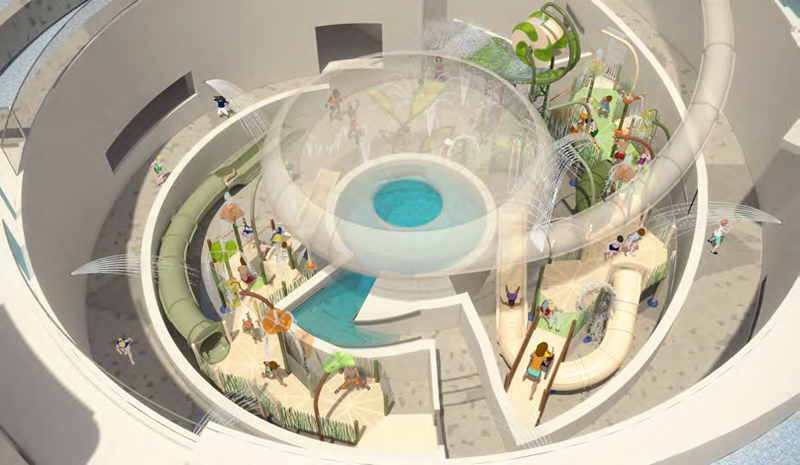 The water park is open plan with the majority of entrances to the water rides on level three, along with a viewing area that will provide all visitors with a bird’s eye view of the aquatic play below. All of the water park levels are connected via a spiralling ramp to ensure every age and ability can access the fun. The Wave will be one of the most accessible water parks in the country. Having decided on the layout of the pool areas and adrenaline pumping slides, the client’s representatives Hadron Consulting and FaulknerBrowns architects approached water display specialist Ustigate to request a design for the remaining interior. 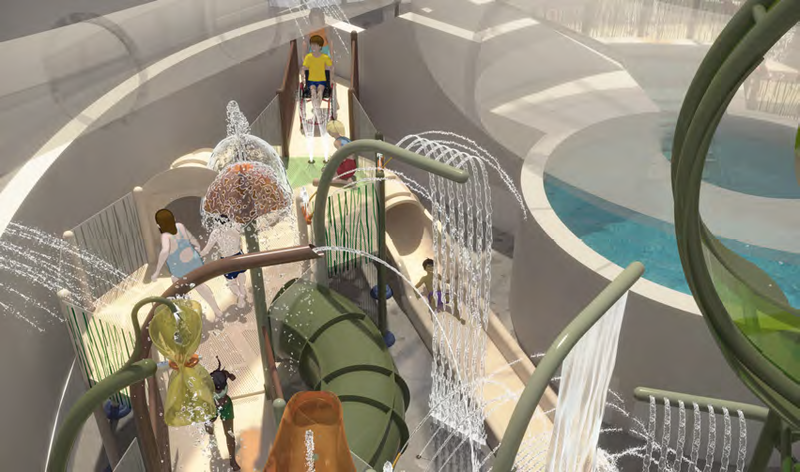 “High Octane” and “Sensory Overload” were the client’s key words to describe their requirement and they knew Ustigate could be trusted to deliver a dynamic aquatic play scheme that would excite and thrill. Ustigate’s aim was to incorporate as many products with differing water effects and spraying directions as possible to enhance Coventry’s all-round aquatic play experience. The access all areas ramp will include five wall sprays that shoot arched streams of water across the course and into the water park below, and the lazy river will have a tunnel of colourful flatbed buckets that tilt and release stimulating splashes from above. The tallest product on the Splashpad will be the exhilarating ‘Superwave’, armed with a turbine and standing 6.29 metres high, it will be creating the biggest splash and soaking everyone in its path. The Superwave is guaranteed to excite all spectators watching from above and all those that are in range and waiting in anticipation below. It is a product that is fun, exciting and loud in character; a thrilling product that amplifies both sound and senses.